Perhaps the greatest need discovered over the years of working in various third world and developing countries is training for pastors, church leaders, ministers and business people. We saw pastors getting a couple of scriptures written out on paper to share with congregations. These pastors didn't even have complete Bibles. Thousands and thousands of church leaders work without any Bible training at all or any courses to build leadership skills. In conversations with many people and looking over Bible school courses, we learned most ministers get little to no courses in working with people and managing a ministry. 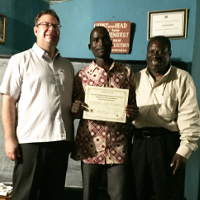 Bible school students learn Bible and graduate with degrees but are ill-prepared to work with people in a ministry. In consultation with local leaders and depending on the need of the group we work with and the number of training days, we choose the appropriate courses to share. Also, we develop custom training as needed. Attendees are amazed at the amount of new skills, knowledge and abilities gained in a few days as compared to other seminars and conferences they attended in the past. Ministries applying the principles learned often improve and increase effectiveness in a very short time. The big difference in the CVM training philosophy revolves around involving participants in the learning process. We created all sessions using adult learning principles and adult learning styles in the material. We present proven Biblical principles for success in ministry and business. We get reports all of the time of ministries doubling, tripling and even larger growth from year to year after applying what they learn in our sessions. As a result of the success of the Clear Vision Ministries Leadership Training, local leaders asked for more in-depth training. The Clear Vision Ministries School of Ministry and Leadership curriculum has been customized to meet needs of leaders in understanding the Bible and working with people to build the Kingdom of God. Like the CVM training, we created each course blending adult learning principles and learning styles. We scripted each course to make it easy for the course facilitators to guide the students through the courses at their own pace. Since we created the courses ourselves, the courses build upon each other and intentionally develop knowledge, skills and abilities. The concepts introduced in the early courses are fully explained and practiced in later sessions. We train facilitators to teach in our style, use the provided materials and guide their classes. Course tests and a final certification test are included. We are actively looking for more locations for schools using our curriculum. 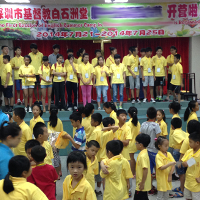 One of the most exciting works of CVM happens when we partner with local people in China to provide "English Camps." We teach in English, with a translator, sing in English, spend time with the campers and more. We have served campers ages 5-26 over the years (not all at the same time). We have a yearly place for these camps in July and always need help. We invite you to pray about joining us in China for this life changing camp. We have volunteered for other camps upon special request. We have led game times, shared devotions and presented nightly messages to campers. A week of camp gives the opportunity for people to leave their normal lives and participate in something unique. With the normal life left behind, it is amazing how people hear from God and respond to Him. From time to time, CVM takes on construction projects when the need and volunteer base comes together. We have worked on renovations for several orphanages and helped to build a number of schools. One year, we took on a three month project to finish out a house for 25 orphans to move into. 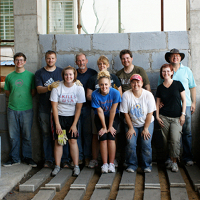 With the help of many volunteers, we have partnered with people in China to work on 10 church building projects. We help local people build walls, as high as we are allowed to, for five or six days. Then, we hold a dedication meeting and invite people from all around to come to the meeting. We have seen hundreds of people come to the dedication meetings to hear songs, listen to testimonies and hear about God, for the first time. Normally, these churches fill with new worshippers within three months of completion. Construction projects require a sizeable amount of funds to purchase materials and make arrangements for teams. If you have a group of people interested in an amazing experience of building a church in China, we can make it happen. It takes a minimum of $15,000 plus about $3,000 per volunteer to cover all expenses, including insurance, buying building materials, Visas, airfare and all in-country expenses excluding personal souvenirs. Sometimes, people find themselves operating ministries struggling to live up to their full potential. Sometimes, people take on ministry tasks they haven't been prepared to operate. Sometimes, people get busy doing good things but fail to stay on target for the vision God has given them. Sometimes, ministries reach plateaus and need to find ways to improve and increase effectiveness before eventual declines begin. Oftentimes, people don't understand the problems they face and reach for the wrong solutions. For years, DeAnna has served as a consultant for businesses ranging from small family-run businesses to Fortune 500 companies to analyze their current situation and lead them to greater profitability and success. She has even helped businesses on the verge of closing their doors forever to turn around their operations for success. Jimmy has worked with many ministries over the years, listening carefully and providing answers and solutions to various challenges. Finding the right areas to adjust is very important to increase growth and succeed. CVM uses processes to analyze ministries/organizations and to identify areas for improvement that lead to greater success. We don't provide solutions until after we take the time to learn what is actually taking place. We customize solutions for each situation and the vision of the organization's leadership. Then, we offer further help through training, personal coaching and other methods to implement solutions. Just one example, a few years ago, we were in Zambia, Africa, sharing with a group of missionaries. After encouraging them through the Scriptures, we shared a special time of praying for one another. One lady told us later that she had been so depressed she could not even get out of bed most days but after our meeting, God had taken away the depression and she had been up and actively involved in the ministry again. Another couple was preparing to leave Zambia forever but God spoke to them during our meeting and changed their outlook and focus, causing them to change their plans and continue working in Zambia. Others at the meeting spoke to us about God refreshing them and strengthening them for the work ahead. 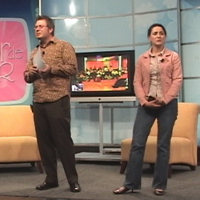 Clear Vision Ministries began in the hearts of Jimmy and DeAnna Kitchens in March of 2000. We were challenged by a seemingly simple question, “What is your dream?” We began praying that God would give us a dream bigger than ourselves. God answered and the interdenominational (501c3) organization Clear Vision Ministries was born to use the skills, knowledge and abilities developed through decades of providing training in the corporate world and ministering and leading people in various ministries to partner with people around the world to give people a clear vision of Jesus Christ. Since 2000, CVM volunteers have worked worldwide helping thousands of people in many different situations and in many different ways. It became apparent that one of the biggest needs in many countries revolves around training leaders and pastors to effectively lead people in the fulfillment of the purposes God has for them. In response, we created CVM Leadership Training and then, Clear Vision Ministries School of Ministry and Leadership curriculum to meet this need. The approximately 18-month school combines Bible knowledge and understanding with skills to lead people. Because we wrote the material, the courses intentionally build one upon another to establish and strengthen knowledge, skills and abilities desperately needed in churches, ministries and businesses. Almost all Clear Vision Ministries projects take place in third world and developing countries. We do not ask for honorariums or "love offerings" on CVM projects in other countries. Instead, we depend on CVM partners to provide the funds needed for each project. Giving securely toward CVM projects is as easy as clicking "donate" and following the instructions. Of course, checks can be mailed to CVM or secure bank to bank transactions can be arranged. You can read through some of our experiences on our CVM Past Projects page. Look for an upcoming project to work on in the future with us. You can contact us by clicking the email button and we will respond as quickly as we can. 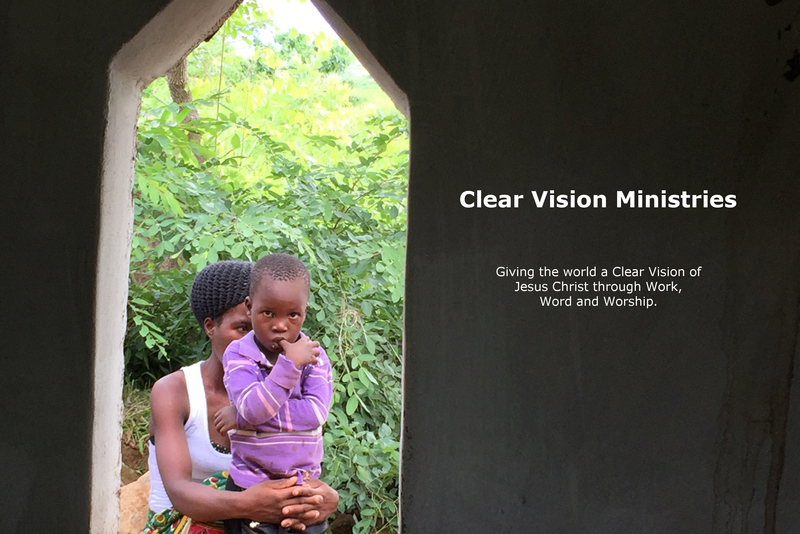 Visit the Clear Vision Ministries FaceBook page to learn about our experiences and keep up with some projects in real-time through our co-founder's eyes. Thanks for visiting and we look forward to partnering together. 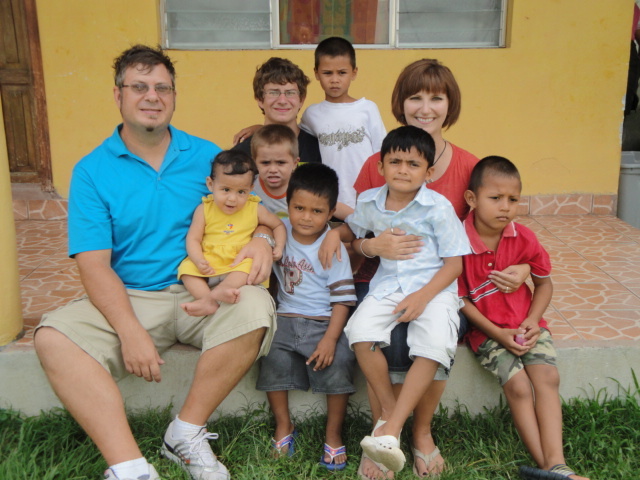 Jimmy, DeAnna and Taylor at a Tocoa, Honduras orphanage. "I have spent 10 years trying to get answers to all of my questions as a pastor. I have gone to many different conferences and seminars and didn't get any answers. During this week, you have answered all of my questions and removed all of my doubts." Ministering to others has been a big part of Jimmy and DeAnna’s lives from the time they were children. For DeAnna, some of her earliest experiences in church involved singing with her family. As soon as she could hold a microphone, she spent time on the platform singing to the joy of God and those in the congregation. While a sophomore in high school, Jimmy felt the call of God to pursue ministry as a youth pastor and preached his first sermon in a youth service shortly thereafter. The next year, Jimmy started teaching Sunday School at his parent’s church and playing guitar during worship. During his junior and senior year of high school, he served in leadership for his school's on-campus Bible club. In October 1988, Jimmy Kitchens and DeAnna Anderson met at a small church in Texas, pastored by DeAnna’s father. They discovered they were attending Southwestern Assemblies of God University together and quickly became friends. Jimmy co-taught the college age Sunday School class during his freshman year at the church. The next school year brought the opportunity to become a youth pastor in the small town of Cleveland, Texas, near the college. DeAnna worked with Jimmy to provide worship for the youth group and has provided incredible worship experiences ever since. In this same year, 1989, Jimmy officially became a minister in the Assemblies of God. On June 2, 1990, Jimmy and DeAnna partnered together for the rest of their lives in marriage. In 1995, they were blessed with the birth of their son, Taylor. Jimmy and DeAnna’s ministry not only includes 8 years of youth ministry, Christian education and worship on a local and regional level, they spent 8 years pastoring a church in Kansas. During this time, they poured their lives into the church, helping people develop their relationships with God and the people they meet on a daily basis. Both Jimmy and DeAnna have a tremendous passion to help people worldwide become the best they can be in all aspects of life. With a wealth of experiences to draw from, increased education and time spent continuing education in a personal way, the Kitchens accept new challenges to reach and help people around the world through Clear Vision Ministries, Inc. They have worked with children, senior adults and all ages in between in a personal way. The Kitchens enjoy encouraging missionaries and ministers to keep up the good work and fulfill the vision God gave them. Jimmy and DeAnna strive to make sure CVM is easy to work with and everyone works hard to make projects successful. We invite you to participate in one or more of our upcoming projects. As soon as we are working on dates for projects, we will list them here for you to see. Most of the time, we start with a general date and then, narrow down to the specific dates as we coordinate with local people. You can start making plans, raising/saving money and get your passport ready for these upcoming projects. Click the picture on the right to download the Clear Vision Ministries Volunteer Application. The completed form is due with the initial donation for each project. In the meantime, you can read about some of our past projects. We are working on putting together CVM projects for 2019. Some of the projects will take one week and some will take several weeks. We need several teams of people in 2019 and we need help raising funds to cover expenses. Please pray about how you can be involved through going, continued prayer and/or donating funds. Please pray for the believers in China and future opportunities to work. All ministry to children was forced to stop at the locations of our past camps and across this large city of 20+ million people. 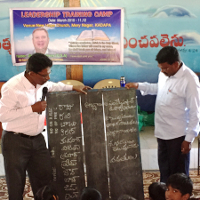 Project Details: Training 16 people to teach the CVM curriculum in various locations in India. Project Details: Partnering with newly created churches or soon-to-start locations to provide evangelistic help. 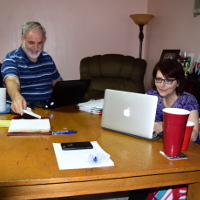 Project Details: Training pastors and leaders. Project Details: Provide times of training for various ministries and provide training for another CVM School of Ministry and Leadership partner. Additional projects will be added as details come together. 2019 dates and projects are being developed and details may change. Jimmy and DeAnna with trainees in India. *Necessary Legal Disclaimer: Funding received by Clear Vision Ministries is controlled by the ministry. While we make every effort to make sure funds go to specifically named projects when available, the final usage of contributions is determined by the ministry. For example, individuals may give funds with a certain project in mind but the project may change for any number of reasons not associated with CVM. We may plan on a particular project in the fall that is completed by another group in the summer. Funds would then be used for areas consistent with our stated purposes.